The focus of the survey was not on whether or not businesses believe Brexit to be good or bad but, instead, how their preparatory plans were taking shape. This blog summarises the results of our survey – with a full run down of the results to be published in next month’s Economic Commentary which we’ll be publishing in partnership with Deloitte. From an economics perspective, it is hard to believe that we are in a position where senior UK Ministers are openly talking about not just a hard Brexit, but no deal. As we outlined back in October 2016, a ‘hard Brexit’ – and a movement to WTO rules – would be the worst of all outcomes for Scotland’s economy. Our estimates suggest a significant negative hit to Scotland’s long-term economic output and jobs compared to a scenario where the UK remained in the EU. Of course, different economists (and different economic models) will disagree over the precise impacts. But the overwhelming view amongst the majority of economists is that such a dislocation of trade patterns with our largest trading partner will have significant negative implications for jobs, investment and prosperity. Even if you disagree with such a view – and there is a small minority – the adjustment shock, not to mention the implications for different sectors, will still be highly significant in the short to medium term. All of this will be compounded if such a ‘hard Brexit’ follows the result of ‘no deal’. Whatever the outcome the UK agrees with the EU, and as the Governor of the Bank of England has argued, a smooth transition is absolutely vital. The reality of a ‘no deal’ scenario is beginning to hit home, with talk of food shortages, drug stockpiles and log-jams at the border. Whilst some of this is likely to be overblown, such issues will be the unfortunate reality of the UK crashing out of the EU. So what does Scottish business make of all this? Here we summarise just a few of the responses that we have received. 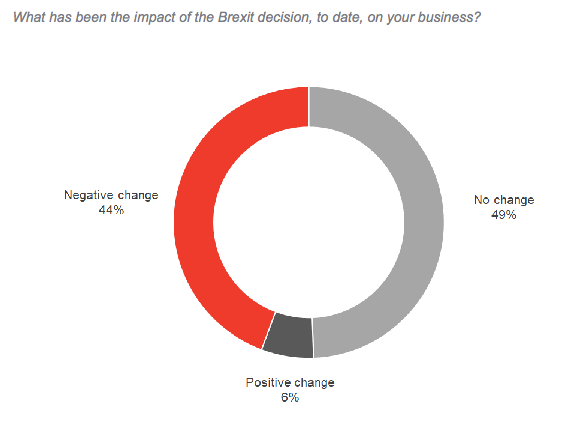 Firstly, we asked firms about the impact of the Brexit decision itself. Around half of the businesses we spoke to said that the decision so far had no impact on their business activity. Only 6% said it had been positive, with 44% saying the impact had been negative. 33% of firms said that it has had a negative impact on current investment activity (4% saying it had been positive), with 41% saying that it has had a negative impact on new investment (3% replying it had been positive). 33% indicated that it has had a negative impact on staff recruitment (with only 3% saying positive). Secondly, Brexit is happening like-it-or-not. So it is vital that businesses prepare for such an eventuality. We asked firms about the level of information that is available to them to make such preparations. The overwhelming response from the businesses we surveyed was that there is not enough information currently available to enable them to plan for potential Brexit outcomes. Whilst this is not that surprising given the uncertainties that currently exist, the scale of the response clearly shows that more needs to be done to help businesses prepare for the range of possible outcomes (even if the final ‘deal’ remains unclear). We also asked businesses about what factors were affecting their preparations for Brexit. 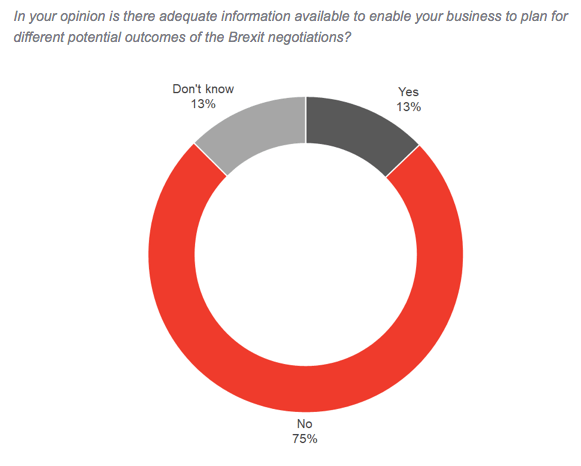 ‘Uncertainty over the UK Government’s objectives in the negotiations’ was the most popular response amongst businesses (with over 59% citing this as a factor). Thirdly, we spoke to businesses about their experience in engaging with government and public agencies to help them prepare for Brexit. Only 5% said that they had ‘sought guidance from government to assist with Brexit planning’. Finally, in terms of possible opportunities: Whilst 51% of business surveyed indicated that they did not see any immediate benefits, 28% of those surveyed believed that there might be benefits from moving away from EU regulations with 26% pointing to possible increased funding from the Scottish and/or UK Government in the future. Only 18% thought of opportunities in new markets outside the EU. In next month’s commentary we’ll discuss some of the detailed responses and wider patterns that emerged from our survey. As we argued back in June, with just months to go until the UK is scheduled to leave the EU, the lack of a coherent plan from within Whitehall about the UK’s long-term economic relationship with our most important trading partner risks holding back Scotland’s recovery. Irrespective of whether you agree or disagree with the decision to leave the EU, the uncertainty caused by this lack of clarity is making it extremely difficult for businesses to develop contingencies or plan for the future. Two years on from the referendum outcome, simply kicking the can down the road – or sleep walking into a no-deal outcome – is simply no longer a credible economic strategy to adopt. Scotland’s leading economic research institute with over 40 years of experience in finding practical solutions to real-world economic problems. To my way of thinking as some 2/3rd of our business goes to England I can’t see that much change in how Scottish business operates. Nor in my view does dealing on WTO terms affect any exporters selling to non EU countries. And so only business dependent on EU countries have to take account of Brexit. It is clear that they should be looking at markets outside the EU as a reserve position. That is where some focus needs to be headed. It’s also not likely that any Scottish businesses that don’t rely on just in time delivery to EU countries should be affected. And so I don’t understand why Scottish businesses should be overally concerned unless you pay great attention to the Project Fear stories that are going around.